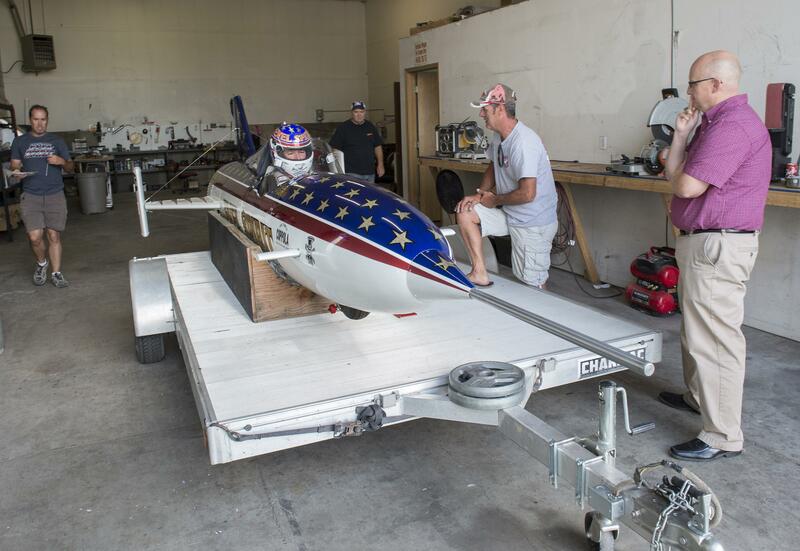 Fri., Sept. 16, 2016, 8:32 p.m.
TWIN FALLS, Idaho – Professional stuntman Eddie Braun successfully jumped over the Snake River Canyon Friday afternoon in an ode to his boyhood idol, Evel Knievel. The rocket reached an estimated 400 miles per hour before its parachute deployed, allowing Braun and the ship to land safely in fields on the other side of the canyon. Braun has said the rocket was identical to the model Knievel used for his failed canyon attempt on Sept. 8, 1974. Knievel landed at the bottom of the canyon when his parachute prematurely deployed, but walked away with only minor injuries. Braun hoped his effort would prove that Knievel could have made it across the canyon if his parachute had deployed at the correct time. Before the jump, the 54-year-old Braun said he was optimistic he would make it across the canyon. “I wouldn’t be doing this if I thought it couldn’t be done,” he said. Other daredevils have proposed similar jumps across the canyon in recent decades – including Knievel’s son Robbie. But Braun appears to have been the first to actually try since Knievel’s attempt. Braun said he spent about $1.5 million of his own money on the effort. Published: Sept. 16, 2016, 8:32 p.m.